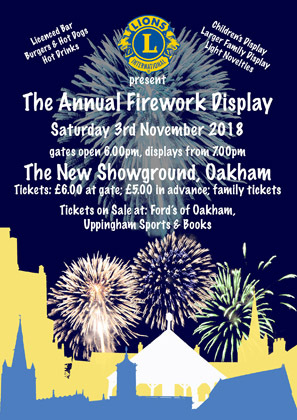 Rutland Lions host their annual firework display on Saturday 3rd November 2018 at Oakham Rugby Club. 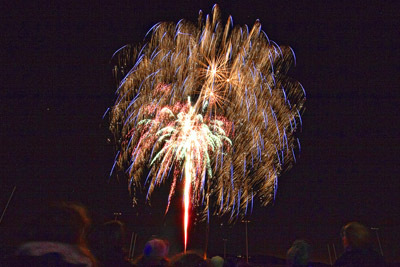 As usual there will be two displays, the first starting at 7pm, slightly less noisy and intended more for younger spectators, the second at 7.45pm, a fully choreographed display with big bangs and bright skies for all spectators. The usual barbecue fayre of hot dogs and burgers will be provided, and the rugby club bar will be open for all types of refreshment. The magical light sabres will also be available for all those budding Jedi out there. Entry remains at £6 on the night for everyone over 5 years old, however both single and family tickets can be purchased in advance, £5 for everyone over five years old, £16 for a family of four and £20 for a family of five. Tickets will be available from Fords of Oakham and from Uppingham Sport & Book. Please note that family tickets will NOT be available on the night. Please note that dogs will NOT be granted entry to the Showground, and we respectfully request that children do not bring sparklers. The Lions Club of Rutland are inviting you to join their FREE Virtual Easter Egg Hunt (VEGG). The hunt is intended for children up to the age of 13 accompanied by an adult. The VEGG hunt will take place on Tuesday, Wednesday & Thursday 10th, 11th & 12th April starting each day at Oakham Library, where you can register between 10am and 4pm. The VEGG hunt will follow the Oakham Heritage Trail, and all entrants will receive a chocolate surprise when they have registered for the hunt, and mini-eggs at the end of the hunt equivalent in number, to the number of virtual eggs located around the trail. The hunt will also ask you a question about the Heritage Trail at the location of each VEGG. To complete the VEGG hunt you will need a fully charged smart phone with Whatsapp installed. Upon registration you will be given a map to guide you round the trail and instructions for using Whatsapp to record your progress and answer the questions posed at each landmark. Come along and have some Easter fun in Oakham with The Lions Club. All vehicular access via Oakham By-Pass as Lands' End Way will be closed to traffic from the Oakham end. The Lions Club of Rutland are inviting you to join their FREE Virtual Easter Egg Hunt (VEGG). The hunt is intended for children up to the age of 13 accompanied by an adult. The VEGG hunt will take place on Monday, Tuesday & Wednesday 10th, 11th & 12th April starting each day at Oakham Castle, where you can register between 10am and 4pm. 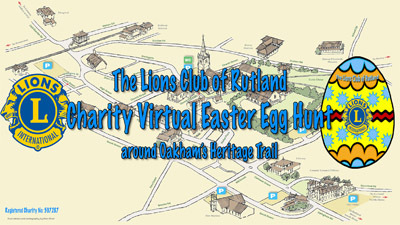 The VEGG hunt will follow the Oakham Heritage Trail, and all entrants will receive an egg when they have registered for the hunt, and eggs at the end of the hunt equivalent in number, to the number of virtual eggs located around the trail. The hunt will also ask you a question about the Heritage Trail at the location of each VEGG. Following on from the success of 2015, The Rutland Concert Band are again presenting a selection of Christmas music and songs in the august surroundings of the Oakham School Chapel on the evening of Tuesday 20th December, at 7.30pm. This year the proceeds of the concert will go toward Millie's Fund which aims to purchase some very clever software that will enable a local girl of 13 who has Rett Syndrome to interact with her computer using just eye movement. Millie has never spoken and has severe mobility problems. Tickets are £8 for adults, £5 for students and can be purchased from Ford's of Oakham. 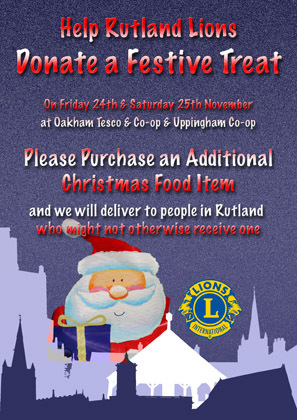 If you are a current member of Rutland Lions, or a Supporter, or you are just interested to learn more about Lions then this is for you. A monthly informal social gathering in the form of a drop-in, alternating monthly between Cafe Nero and The Lord Nelson, both on Oakham Market Square. The date, time and venue for this drop-in will be updated regularly on this website as well as the club Facebook page.